We were turned onto this excellent mulie and whitetail operation by one of our premier Alberta outfitters. He actually called us and made the introductions to this Alberta outfitter. Turns out this outfitter truly has something special. He has been in the guiding business for about 15 years. 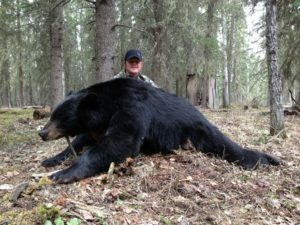 He obtained a US college degree in Wildlife Management, then returned to Alberta and for the last 10 plus years he has been a full time outfitter, with incredibly high success on both species of deer- and many giants take annually! 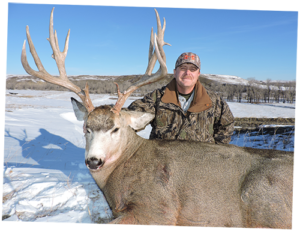 In 2010, Mark Drury (Drury Outdoors on TV) was up and he and a fellow hunter took 3 deer in 3 days with bows, a 181 mulie; a 170 mulie and a 159 whitetail-over 500 inches of horn in just 3 short days!!! That got our attention. Some other things also impressed us. He annually spends hundreds of hours filming, photographing and observing the animals in his guide areas. Learning the animals local habits and territories is a major factor in producing consistent success and in knowing where the big boys are living! All those on the ground hours are very important scouting tools. Here are some more results to consider. 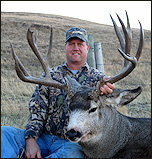 Alan Fox, also a bow hunter, took a 184 mulie, and just grazed a 170 class whitetail, all on the same hunt! 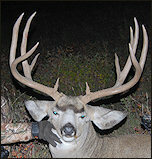 Jason Derting, back for his sixth time, took a very massive 176 mulie with his bow. Other deer included at least 3 more mulies in the 170’s; two that were 187, another that was a 184!And the list goes on. This outfitter averages over 90% success on his bow hunts, and has been 100% on his rifle hunts for many years! If you are willing to pay a bit more than most hunts cost, this guy will get you onto the big ones! Southern Alberta is primarily private land. He knows the landowners, and has over the years established a lot of respect and a mutual trust with them, opening up some great hunt areas. His knowledge of habitat and wildlife, combined with a respect for the area and the landowners, has helped gain some excellent land access in these areas. The nearest major cities are Lethbridge, Alberta (Pop. 80,000) – which is 45 Minutes North/East, and Calgary, Alberta (Pop. 1 million+)- which is 2.5 hours North. We are also only 150 miles (3 hours), North of Great Falls, Montana. Last, but certainly not least is the friendly, hard working treatment that you will receive when hunting with this outfit. He makes every effort to insure your trip is a successful and enjoyable experience. He likes to say that your success as a hunter, and comfort as a guest are the two unwavering priorities by which he operates. He consistently kills mulies in the 160, 170, 180 class and even larger, and takes whitetails in the 140 to 170 class, and a few larger. And his success rate is incredible given the quality of the deer being sought. 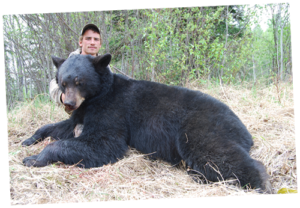 Bow success is generally 90% or so; and gun has been 100% for years—and all this on very high trophy quality animals! All his deer hunts include guiding, meals and lodging and are done with one guide assigned to every two hunters. There are normally 6 to 10 hunters in camp at any one time. Stay in a comfortable farm house with multiple bedrooms and baths and enjoy home cooked meals. TRANSPORT: Fly to Great Falls, MT or to Calgary; rent a car. When traveling to Canada either by air or ground, there are a few basic things to remember. You will be required to clear through Canadian Customs regardless of whether you fly or drive. You will need to present identification in the form of a Passport. A passport is now a requirement for entering Canada and returning to the USA. At customs you will be asked several questions about the purpose of your trip, the length of your stay, where you live, who you are hunting with etc. It is a very good idea to have some written verification (like a contract or at the very least a brochure from your outfitter), to show what your destination is. CALL US! You may be denied admittance with a firearm. Archery equipment does not fall under these requirements and therefore has no declaration form. NOTE: You will also need to have a USS CUSTOMS Form 4457 identifying your gun by serial number. You obtain this before leaving the US from your nearest US Customs office. Other then the inconvenience of driving there, the actual 4457 is simple and quick- just bring your guns and cameras with you for inspection and to verify serial numbers. The 4457 is proof the firearm is your’s legally. TRANSPORTING YOUR GAME AND TROPHIES HOME. Exporting your game home is a relatively simply procedure for most types of game as long as you export the animal (Head, Hide, Meat etc.) yourself, with you as your personal baggage. Your hunting license will act as your export permit so keep it with as you leave Canada. You will also need to fill out a U.S. Import/Export permit Form 177. Although these can be picked up at customs, or via the NET, the process is simplified if this form is filled out in advance. Transporting your game home is obviously easier if you are driving, but the requirements are still the same if you fly, as long as you comply with your airlines procedures. If you are flying you may want to check with your airline for their particular weight and packaging requirements, they vary by airline. When I hunt Canada there’s only one choice. 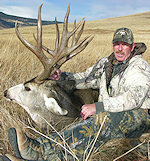 His mule deer hunting is the best in the world. I don’t think I will ever miss a season hunting there. I look forward to my annual hunt more than any other that I go on. – Mark Drury, Drury Outdoors.